Since Beta stage of Windows 7, i am using it as primary Operating System on my HP Pavilion laptop, which was 64-bit. And also installed 32-bit RC Built.7100 on 6 May. Installation of RC was pretty good and smooth, one of the best feature I seen that, I did not required to install any drivers. It automatically took almost 95% of the drivers and for that which it did not took, searched for Windows Update and installed automatically, further whole process took only about 20 minutes to reach to new Windows 7 desktop screen. This was the first impression and definitely won my heart ! The Base score was 3.5 which was 3.2 in Vista. It was OK, as my laptop is a bit old with low config. ! Microsoft has already announced the system requirements for Windows 7 and they’re as expected: a 1GHz or faster CPU, 1GB of RAM for 32-bit systems (and at least 2GB for 64-bit PCs), 16GB of hard drive space (20GB for 64-bit) and a DirectX 9-compatible graphics capability with WDDM 1.0 or higher. This is just for reference. After searching for new things in 7, for hours. And started installing some important software for my use like CCleaner, Mozilla FireFox, Picasa, FeedDemon, Digsby, Comfort Keys, Diskeeper 2009 and ” Kaspersky Anti-Virus 8.9 Technical Preview foe Windows 7″ which also gave me trial for about 170 days. And after installation of these and Windows Update, restarted my system. It took normal time to restart. A week gone fine without any problem and also discovered many new things which was quite useful and also attractive. This time Internet Explorer 8 and Windows Media Player 12 was much stable & fast and I also tried to see the new feature called ” Virtual Xp Mode ” but I was unlucky to install it as my processor did not supported visualization. 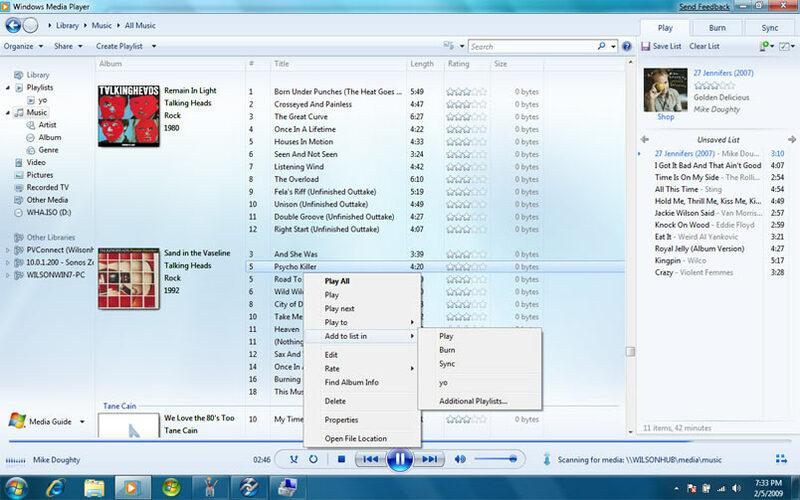 Windows Media Player 12 was able to play a large number of video formats without installing any codec pack. 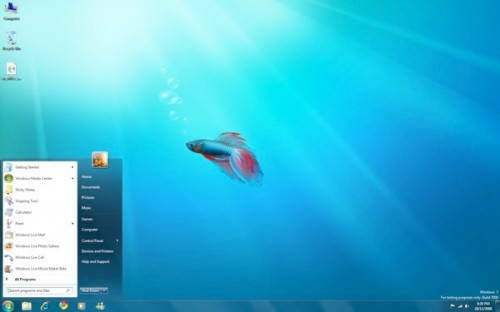 But unfortunately I was not able to play very few formats which forced me to install ” Win7codecs ” from Shark007. Now I was able to play all formats in WMP 12 smoothly. I love to play all video files in WMP as the video quality is much clear and better as compared to other Media Player like VLC Media Player. WMP 12 also took very low processor as compared to previous one, i.e. WMP 11 in Vista. Now USB drives with media automatically show up in Windows Media Player without interrupting you with dialogue boxes. In mean time I tried out new features like ” Troubleshooting in Action Center ” , which I felt a very important feature for general/simple users to trouble-shoot many type of problem related to Audio, Video, Internet and others. It got very user friendly interface and have solution to many related problems to drivers and so on. Windows Online Troubleshooters Pack is also available which have too many options to solve the related problems. Overall, I can say this is the feature which Windows was missing in previous OS. Paint and WordPad both have interfaces based on the Office 2007 ribbon – although with so many fewer commands, relegating zoom to a second tab doesn’t feel like an improvement. It also have new photorealistic icons to match the rest of the Windows interface, and the Brush menu in Paint gives you a much better idea of the different effects you can get, from calligraphy to crayon. Windows DVD Maker also looks much more like a wizard than an application, but we do get all the options I need to create a DVD with a custom-animated menu. Coming to network, It was quite easy to share file across other PCs which is connected to our wi-fi LAN. Since 12 days I never got a single error regarding LAN and even multi-player games, they run quite smoothly. Coming to Bluetooth, I can’t say anything about this as this got wonderful feature of searching new BlueTooth Devices and moving files between them. Now using bluetooth we can easily connect and pair mobile phones and bluetooth enabled stereo earphones. Power management is quite good as a new feature of dimming display is also available. Now I get more backup on Battery as compared to Windows Vista and others. Further looking deep, my Battery health is not good, it displays a red cross sign over the battery icon in tray. On putting mouse over it shows ” Consider Replacing Batteries “, which again is an important feature which was not present in last version of OS. Now you can choose whether you want your favourite music or what you’ve been playing recently on the jumplist. Jumplists are one way of doing this, but to avoid them becoming unwieldy they’re now limited to 10 items by default. The streamlined control panel is also full of links to related options and buttons with key options along the top. Don’t know why the scores became low, I’m still searching for the possible reasons as the hardware did not change, the scores would have remained same. Again one thing happened, even though the WEI scores were low , after two days system started working in the same way as it was 3-4 days ago, I mean It again became fast, even this time I don’t know how this happened ? I think it may be due to Hard-Disk overheating for last 2 days ! he Security is much more advance and we can also adjust the setting of ” User Account Control ” according to user need and experience, which was also an annoying feature for some people in Vista. Finally, I can say this is the perfect OS which I needed for present needs. In these 12 days I installed Windows 7 RC on 8 different systems which belonged to my friends of my college and again it took almost all ( i mean 90 %) drivers of the hardware. And it is working quite well. According to this one can say is Windows 7 going to become driver free OS ? ?….an ultimate OS from Microsoft. The battery – consider replacing – is a BUG! Basially W7 does not recognise certain batteries propelry and assumes wringly that they are faulty!! Hopefully fixed on RTM. 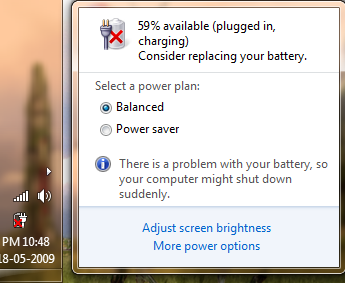 Your performance might dip when you are using your laptop on battery rather than charger. Some laptops have a feature where they reduce/limit the CPU speed to conserve power.